John Jack, CEO of Galetti Corporate Real Estate. Rising municipal rates and taxes is a hot-button issue - one that negatively affects, not only operating costs and gross rentals, but also makes demand on property management resources. Heartwood Properties, born out of a successful joint venture between Gauteng property developers, Brydens Group and Montagu Property Group, is the first property company to list on the new 4 Africa Exchange (4AX). The South African Institute of Black Property Practitioners (SAIBPP) will be hosting its annual convention taking place between 7-8 August 2018. JSE-listed Echo Polska Properties (EPP), the leading owner and operator of shopping centres in Poland, has officially announced that a change of its company name from Echo Polska Properties N.V. to EPP N.V. has been registered by the trade register of the Dutch Chamber of Commerce. 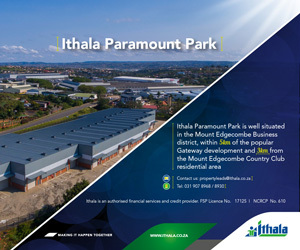 Industrial property in the East of Gauteng produced a strong showing in 2017, with good leasing and development activity recorded in Growthpoint Properties’ industrial portfolio.